STILLWATER, Okla. - Oklahoma State player Tyrek Coger died of enlarged heart, according to a medical examiner's spokesperson. Tyrek Coger died Thursday after collapsing at an Oklahoma State University men's basketball team workout. He was rushed to Stillwater Medical Center where he was pronounced dead at 6:23 p.m. CT, according to the team's statement. During a press conference Friday, a spokesperson said it still may be several weeks before the medical examiner’s full results are made public. It was announced that Coger’s health information cannot be released due to HIPPA laws. They did confirm that he underwent health evaluations before joining the team, however. 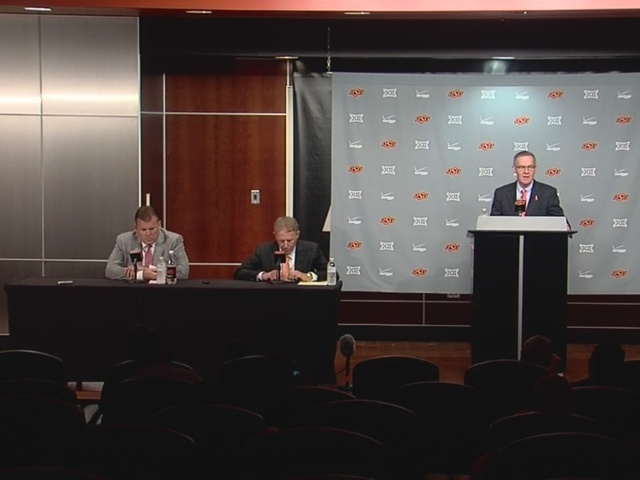 The NCAA allows for eight hours of practice running stairs, continued the OSU spokesperson, and on Thursday the basketball team said they followed those rules. After the exercise, Coger reportedly sat down and his teammates went to check on him and then called 911. Head coach Brad Underwood was out of town at the time. He expressed great sadness for the team's loss. "Tyrek was excited to be at Oklahoma State and had such passion for the game and was looking forward to being an OSU Cowboy. Losing a member of the team is like losing a member of the family. But we know our loss pales in comparison to the pain his family is going through." “… 21-year-old man that had his whole world in front of him. I’m extremely proud to have been a part of his life,” said Coach Underwood during the press conference. Coger transferred to OSU from Cape Fear Community College in Wilmington, North Carolina.